These are laptops that have Optical Drives that are not easily swappable/removable. For some of these laptops it may just be as simple as removing a screw from the bottom of the laptop to slide the optical drive out. For others you may have to remove the keyboard, or partially disassemble the laptop to remove the optical drive. This scenario is often found in laptops that come from the factory with a slot-loading (as opposed to tray-loading) optical drive like those found on the Apple MacBook, MacBook Pro laptops and the DELL Studio 15 Series laptops. Slot-loading optical drives have a tiny slit in the laptop. 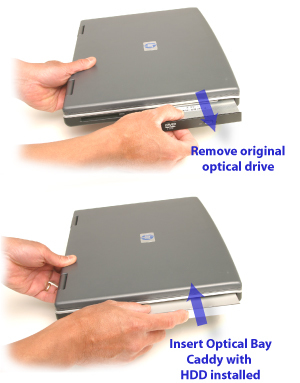 The CD/DVD disc is inserted into the optical drive via the slit. Tray-loading optical drives have a button on the faceplate. Press the button to release a tray to insert the CD/DVD in the tray-loading optical drive. 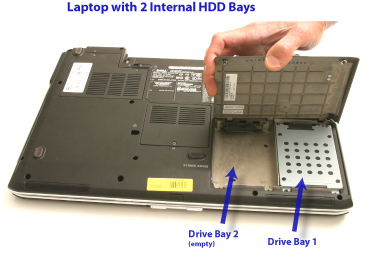 These are laptops that have multi-function optical drive bays such as the DELL Modular-Bay, DELL Media-Bay, HP Upgrade Bay, HP MultiBay, and Lenovo UltraBay. These laptops with these special mutlti-function bays were designed to have their optical drives easily removable. Some examples of these laptops are the DELL Latitude E6400 & E6500 and the HP Elitebooks & HP-Compaq Notebook PCs. 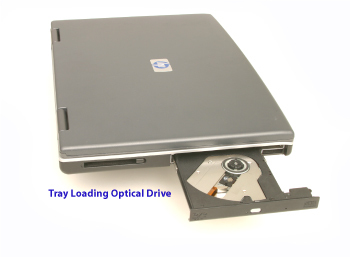 To replace the main/primary HDD with an SSD and use the original HDD as a 2nd drive in these kinds of laptops, you will have to remove your optical drive and replace it with your original HDD using a Optical Bay HDD Caddy designed for that laptop's special multi-function bay. 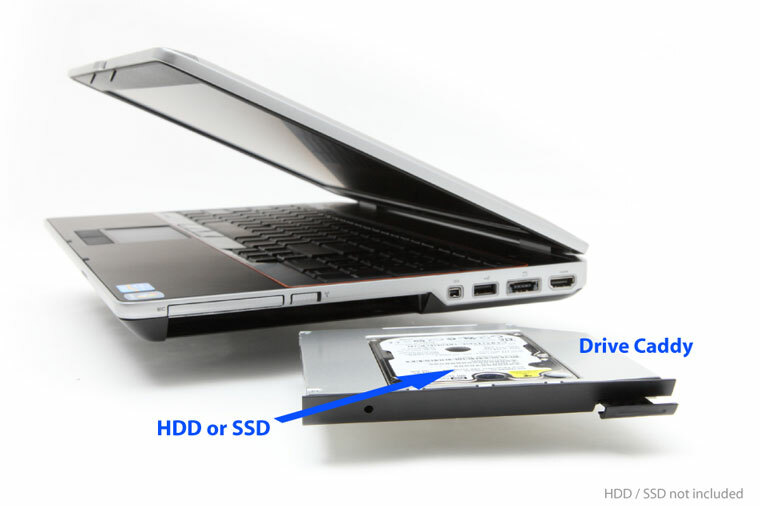 These are laptops that have two internal HDD bays and an optical drive. A large number of laptops that have a screen size of 17-inch or larger have two internal HDD bays such as the HP Pavillion dv7, DELL Studio 17, HP Envy 17 and DELL Inpsiron 1720. Most of these laptops come from the manufacturer with only one HDD installed and an empty 2nd HDD bay. To replace the main/primary HDD with an SSD and use the original HDD as a 2nd drive in these kinds of laptops, you will need a 2nd HDD Caddy Kit designed for that laptop's special 2nd HDD drive bay. 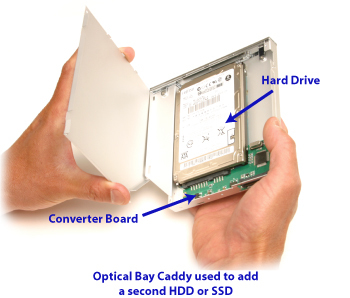 These 2nd HDD Caddy Kits vary by notebook model. Some caddy kits are just a simple bracket and screws and others more complex with bracket/caddy, connector, cable and screws. 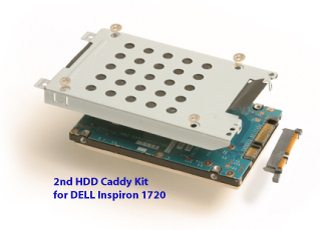 Kits are specific to notebook models, so be precise if you will be ordering a 2nd HDD Caddy Kit. These are small, sub-notebook laptops. Unfortunately, there is no room in these laptops for two drives. Therefore you can't have a secondary drive.